This proclamation to the Aborigines of Van Diemen’s Land was actually from Governor Arthur, not Davey. The proclamation was supposed to promote harmony between colonists and Aboriginal people, but was ineffectual. Conflicts developed to such an extent that Martial Law was declared. To see a map of conflicts that happened in Tasmania, please follow this link. All coordinates are approximate. This map is still being developed and may not fully reflect the places in the following list because of name changes and difficulty confirming some locations. Many thanks to readers who email information about colonial frontier conflict sites. Locations will be added to the list below as new information is found and time permits. If you know of incidents that occurred, but are not included in the list below and wish to contact the author of this website, please use the form on the Contact page. WARNING: Viewing this list may be offensive and upsetting to some readers as it contains placenames and sites where killings took place duing the frontier period in Tasmania. Tasmania wide. 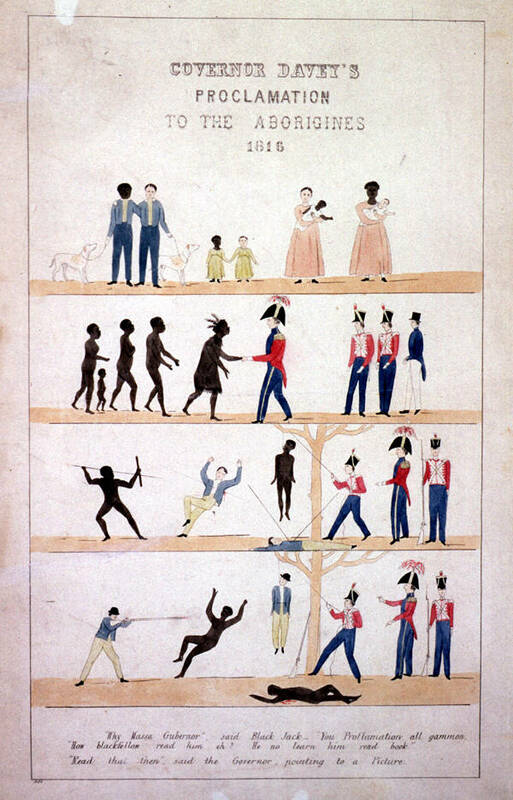 Magistrates authorised to use force against Aborigines following alleged killing of 18 colonists. Press considers notice a declaration of war.